"Relax; it’s only a business cycle"
"Bellevue’s office market more ‘fit’ than Seattle’s"
"Further pain coming in the multifamily markets"
"Is the recession for hotels ready to end?" "Retail’s bumpy ride starts to smooth out"
"Sumner’s industrial market weathers the economic storm"
"New office towers help CBD move north"
"Pioneer Square gets ready for change"
"A lean, mean, clean and green future"
"10 things I learned in Green Broker school"
"Aigner finds calm after near-death experience"
"Are you prepared for the big flood?" "Need a loan? 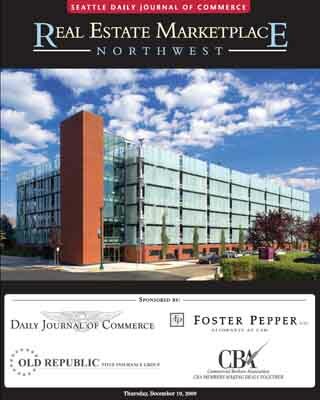 Here’s what you should know"
"Why the economic loss rule matters"
Commercial Real Estate Insights is co-hosted by the Seattle Daily Journal of Commerce, Foster Pepper PLLC, the Washington State Commercial Association of Realtors and Old Republic Title. Insights presents industry experts who share their perspectives on the near- and mid-term business outlook. After observing past difficult economic times, it is clear that, historically, recessions and depressions have recovered due to both public and private influence. Leadership emerges in challenging times that results in redirection and/or growth. Current economic challenges are no different. Chris Pratley has been at Microsoft since 1994. He co-founded the OneNote team in 2001 and has been part of its success and innovation ever since. From 1995 to 2006, he was also a part of the Word team, starting on Japanese Word95 and growing to be the group manager for the Word program management team. Bill Pollard has been a market leader on nearly all sides of the commercial brokerage business. As co-founder of Pacific Real Estate Partners, a regional commercial real estate brokerage, he has exclusively represented major corporate tenants, landlords and many of the nation’s largest investors. Dean Allen has more than 30 years of experience in the design, construction and real estate industries in the Pacific Northwest. He has helped build McKinstry from a mechanical contractor into a comprehensive design, build, operate and maintain enterprise with more than $350 million per year in revenues and 1,500-plus employees. Wright Runstad earlier this year developed a 469-stall parking garage (pictured) and 125,000-square-foot office building for the Washington State Employees Credit Union in Olympia. Copyright © 2009 Seattle Daily Journal and DJC.COM.